Kat has been a vital member of our Penn Treaty team this year! She came to us with a degree in Education and Public Policy from Pennsylvania State University, where she also minored in Sociology and Political Science. No stranger to the Philadelphia education system, having worked at YouthBuild while an undergraduate student, she has fit in perfectly to the Penn Treaty community. Welcome, Kat! Kat color-coordinating with a student. It is difficult to write this blog from my own perspective; without saying “we” instead of “I”. Nothing that has been accomplished at Penn Treaty so far this year has been because of me alone. It has been because of the work of our little Penn Treaty team, helpful school staff members, and, of course, the students. I have been a part of many different teams in my life, but never one I’ve enjoyed as much as this. In October, we were able to test the effectiveness and creativity of our team by planning and carrying out College Week. What started as a lot of grand, abstract ideas was eventually streamlined into a week of events involving Penn Treaty staff, students, and other members of 12+. College Week consisted of events for all grades, but gave us an opportunity to work closely with seniors in particular. 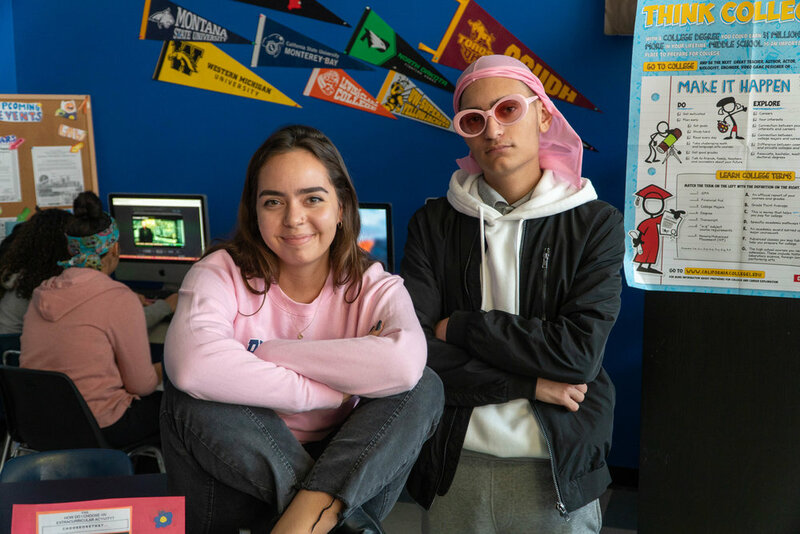 The senior class worked for over a week researching different colleges in preparation for the culminating event of College Week: the student-run college fair. On that Friday, the seniors set up their presentations throughout a designated hallway, and students from all grades came through to hear what the seniors had learned. Despite being drained from a full week of workshops and events, the energy of the senior class was infectious. They were fully invested in learning about their designated colleges, and even more willing to share that knowledge with their friends and peers at the fair. During college week, Seniors were able to attend a panel where teachers answered questions about their college experiences. Underclassmen crowd the hallway during the Senior-run college fair. I went into College Week with no expectations, hoping that students would enjoy it, but prepared to be ok if they weren’t super interested. I was pleased when students were engaged in our workshops, and were patient and kind in groups I was facilitating. However, I was not surprised. It would be unfair to say that I was impressed because these are all qualities I have seen in them all along. It is truly a beautiful thing when something you worked on is successful, especially when others find joy in it as well. Seeing the work of our team and of the students come to fruition over the course of the week solidified my belief in our Penn Treaty team, in the Penn Treaty students, and sparked a belief in myself that has sometimes faltered. After the success of our College Week, I am motivated to plan and execute more events throughout the year, and I am confident in my ability to do so. I have to keep reminding myself that it is only November, and that there are so many more grand ideas to be had, and so much more joy to be shared.